VENEER STONE MOLD- COMPLETE SAMPLE KIT for mold quality testing. 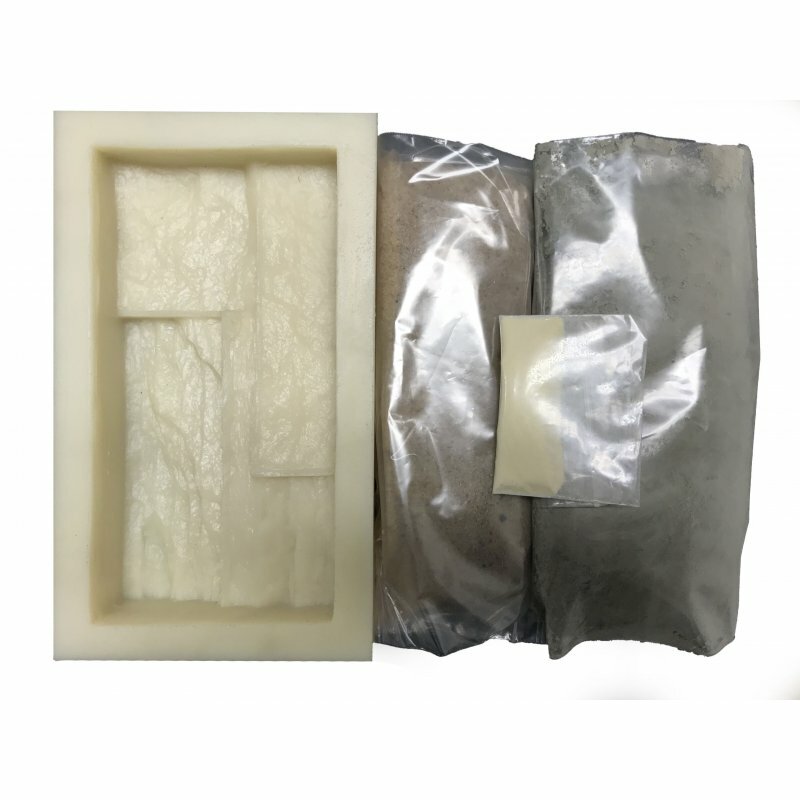 This kit includes all material needed to make a concrete stone cast except water. No special equipment, experience, or skills are required to make a stone for your project. - - JUST FOLLOW OUR SIMPLE INSTRUCTIONS. 1. Apply Release Agent to the mold. 4. Mix all materials with water thoroughly at least 3 minutes making sure that you scrape the sides and bottom of the mixing container. 6. Pour rest of the material. 7. Cover mold with a plastic sheet. Allow concrete to cure a minimum 12 hrs to 24 hrs , it all depends on what concrete mix is used, weather conditions, the size of the mold, and the amount of water used. The cycle time can be reduced further by using a faster setting concrete mix. The best way to store the stones is by covering them in plastic at temperatures above 70F(20C) degrees for about 12 hours. Please note: The mold is pre-released. No release agent required for the 1-st casting. Do not store the curing stone in direct sunlight for the first 7 days, at least. Release agent will aid in releasing concrete or gypsum plaster castings from rubber molds. Release agent provides a clean, positive release and does not interfere with or affect surface detail and helps minimize air bubbles in finished castings. Properly used, mold release improves molding efficiency for a variety of casting applications and will actually lengthen the life of your production mold.